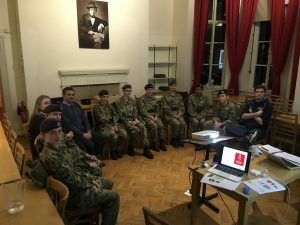 CMC’s design team were in Buckinghamshire this week to run 3 workshops with National Trust volunteers as well as a number of RAF Air Cadets from 871 (Penn) Squadron. These special interest groups are assisting us with the production of a new multimedia exhibition due to open this summer at Hughenden Manor. The displays will tell the story of the secret map making operation that was based here during the Second World War. Codenamed ‘Hillside’ it played a critical role supporting the pilots of nearby Bomber Command. Around 100 skilled cartographers were tasked with drawing up the maps produced using intelligence from aerial photographs delivered by the RAF’s reconnaissance missions. These were then taken into the air and used for bombing missions. In the dim amber light of the cockpit these very precise drawings were crucial in increasing target accuracy. Our workshops provoked some lively discussion and provided valuable feedback to our production team. We heard a fantastic range of comments and ideas about how we can make the exhibits accessible for all. The aim is to ensure that this fascinating story is sensitively and authentically presented, allowing visitors to learn and engage with this secret wartime story.